Last edited by rcollum; 01-07-2017 at 07:45 AM. It was cold when I drove to Katie's early this morning, but it was not snowing. It started snowing lightly after 7:00AM, but did not amount to much. Then, around 8:00AM, it started snowing more heavily. We had a reasonable turnout today, (no Ferraris) but most people decided to leave shortly after 8:00AM, to beat the worst of the bad roads. The drive home was intense. Strange January weather this week... This morning was 47F, overcast, with intermittent very light mist; no rain. We are enjoying a warm spell for February, though it was only 29F on my way to Katie's this morning. The start of a three-day weekend meant a really well-attended cars & coffee today. A good showing of exotics. Ian L. brought his '29 Bentley, and his son's Porsche Cup car. A nice happenstance - Paul M.'s gorgeous '32 Ford Roadster was parked next to a beautiful split-window, fuelie Corvette, which I had not seen before. Doctor Dave drove his Cobra Daytona Coupe. Thanks for taking all the time to document this event. Its a great way to stay in tune with the event. I did a quick visit to Katie's this morning. I had to an event in Pennsylvania, so I was only around for a bit over 2 hours. It was still time well spent. Katie's had a smaller turnout this morning - it was cold today, and lots of regulars are at Amelia Island for the concours. One nice side-effect was, we had several groupings of cars by marques; not something that can usually happen when we are crowded. Amazingly, two modern Ferraris were there this morning. 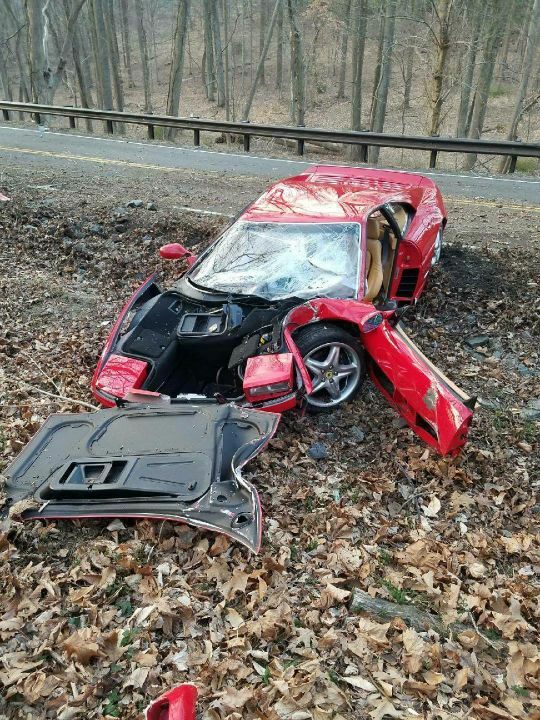 Possible Ferrari Crash on Georgetown Pike, 03/11/17? I was forwarded this post, but have been unable to confirm exactly where and when it happened. I was at Katie's, and never saw this car Saturday. Does anyone know about this? It looks pretty bad; hope everyone involved is OK. Another reminder to BE CAREFUL OUT THERE! Bob- Looks like the chassis is well and truly bent on that one. The roof is even bent. Must have collected a couple of trees during the spin. Black ice? Every day I look around, and if nobody is shooting at me, it is a pretty good day. Understand it was a deer avoidance maneuver, better to have hit the deer than a big solid tree. Last edited by Admiral Goodwrench; 03-12-2017 at 12:46 PM. I took a snap of you as you were leaving Katie's today! The rains of the last couple of days finally abated, and we had a cool first Saturday in April. A good turnout, with a handful of Ferraris, and some other cars of interest. The local Corvair club brought out 7 nice examples of their cars. This past week was filled with strange weather; nice & temperate early in the week, with violent thunderstorms Thursday, and high winds (including some tornadoes in the area) on Friday. Saturday was cold, clear & GREAT!